PICTURE ON THE COVER — Tillandsia macbrideana. Photo by W. Rauh. Bromeliad pair in Chiriqui highlands. We barely caught a breath of the hot heavy air at Tecumen International Airport servicing Panama City, when we were airborne again on Copa Panama Airlines and heading west towards the upland town of David (dahveed), the capital of the Chiriqui Provence. Its small quaint open-air terminal with black fieldstone pillars is a favorite port of Panamanians fleeing the hot tropical lowlands. On weekends, hundreds go there for trout fishing in its cold rushing rivulets or for hunting tapir or wild boar on the verdant hillsides, or just for loafing in the cool mountain air. Bordering Costa Rica to the west, the Chiriqui boasts both wild and tamed land and flattened plateaus generously intersprinkled with mountains. Besides a respite from the heat, this mountainous retreat is also a major grazing and crop-producing area of Panama. North from David we drove for the next half hour. Billowy clouds low on the horizon begged our attention as they captured the setting sun. Nearing our destination we began to climb, and then breaching the hillock's crest, a purple shadow-clad valley greeted us warmly. There, down in the vale astride a rambling, rushing river nestled Boquette — a classic 'Christmas-card' hamlet, out of step with the century and ever as charming as European counterparts out of the Tales of Hans Christian Anderson. Even the natives there say the 'highlands' are like Switzerland without snow, and as we drunk in the scene we tacitly agreed Boquette looked like a miniature Alpine retreat. We plunged into the valley, then glided through the quiet deserted streets. In the fading light we passed a small park where in a rose garden a conspicuous sign read "prohibo cortar o arrancar flores y plantas," or roughly translated — "don't pick the flowers!" On beyond the market and up the hill, we stopped. "Fundadores," called our guide. Now nearly dark, three of our group exited the little bus and headed for the Hotel Fundadores. Our journey continued only a short distance up the hill and ended abruptly at the base of the mountain above and alongside the boulder-strewn river. In the last light, I caught a glimpse of a suspension bridge spanning the river, not far down a footpath nearby. "This is our home for the next few days," our guide called out. Mrs. Elliot, the owner of our beautiful chalet-like hotel, soon greeted us. Our host for our mountain sojourn, she proved to be as fascinating as she was gracious. After dining, and by poking around a little, we learned she was a superior cook, and the many blue-ribbons hiding the wall of her den told of her interest in prize cattle. 'Panamonte' read the sign above the hotel doorway. "It means mountain pass," volunteered Mrs. Elliot, when she noticed our inquisitive looks. "Come, I'll assign you rooms," she said, "you'll want to freshen up before dinner." The room assigned to me and my wife was on the second floor overlooking the valley. Large billowy beds, reminiscent of the clouds we passed earlier, added to the homeyness of this mountain lodge. They later proved to be the exact prescription for our jet-lag and tired bones. Our plans for the next day were to collect plants after breakfast, but as daylight streaked the heavens, and my wife and the others slept on, I dressed quickly and went out searching for bromeliads on my own. The sun was still behind the mountain and a chill pierced the air; the temperature had dipped into the low 50's overnight. The thought of finding bromeliads, however, soon warmed me up. I barely left the front gate of the Panamonte when I noticed a familiar form, even in dim light, in the dense bougainvillea shrubs. Parting the flower-clad foliage, several Catopsis nutans nodded their inflorescences in greeting. I left them there for later. Before long the sun painted the rim of the valley, and I ascended the trail leading to the side of the mountain. Ahead, silhouetted against the hilly backdrop were two large trees, so I pressed on toward them hoping to find a bromeliad or two among their branches. Nearing the trees I couldn't believe what I saw. Not one! Not two! Not even a hundred plants, but every limb was covered with dense mats of epiphytes. In good light now, I could see them everywhere. Large and small — and all were out of reach — except an overburdened branch that had fallen to the ground, a casualty of excessive growth and weight. Sun-colored, their short branched spikes betrayed most of them as Tillandsia tricolor. I later estimated more then 3,000 plants on each tree. 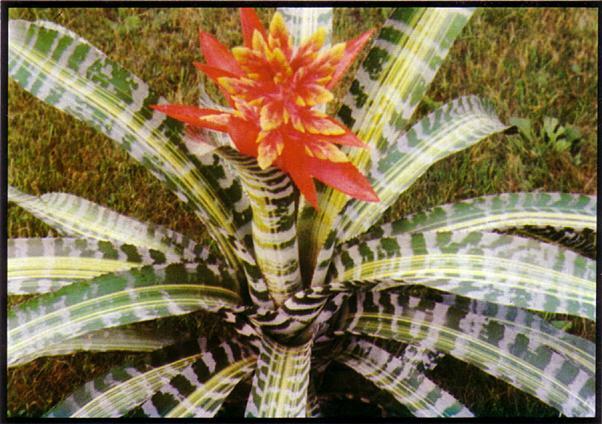 Sprinkled among the tricolors were also large bromeliads which appeared to be Guzmania donnellsmithii. The trees were too tall to ascend easily so I sought easier game for the moment, relinquishing only the act and not the thought of collecting some of these later on. Across the river smaller trees and shrubs now seemed to beg me to search their out-stretched finger-like twigs. Crossing the suspension bridge rewarded me with T. complanata and T. multicaulis. I spied Guzmania monostachia and took only a few of this "weedy" widely distributed species. Another Catopsis vied for attention nearby — it too was an old friend, C. sessiliflora, abundantly clustered on an overhead branch. A cow resting beneath the tree eyed me curiously as I plucked a few plants for my collecting bag. Watching her ruminate reminded me it was time to return for breakfast. I had filled one bag and that was sufficient for the moment. By 8:15 our transportation, a university bus, arrived and we were on our way out of the valley and across the central flatlands in search of new plants. Large termite nests ballooned on trees and fence posts along our route. Our guide for the trip was Henry Butcher, a resident of Panama and an authority on the epiphytes of his country. This morning he was leading us to collect in upland woodlots and along pasture windbreaks where access to plants would be easy. Our collecting poles in hand and collecting bags tucked in our belts, we exploded into the landscape in search of our quarry. I had spied several Aechmea mexicana enroute and I wanted at least a small one or a pup for my collection. Looking up as I walked I nearly tripped over a full-sized one on the ground — another case of too large a plant picking too small a branch on which to grow. Snip, and its pup went into my collecting bag. We pushed on into the gulleys and low hillsides looking for downed trees and low-clinging plants. All around, enormous clusters of Tillandsia juncea, resembling chubby porcupines perching on gnarled limbs, were within easy reach of our collecting poles. Most were along the borders of pastureland where they typically baked in the sun all day. Deeper in the woodlots were the less sun loving plants — more T. multicaulis and at least two new Catopsis, probably C. nitida and C. micrantha. Red-striped, thin leafed plants were on the same trees, and their old flower stalks identified them as Guzmania zahnii. Darien jungle from hill top. Our quest took us up and down the back roads during the next two days, but when our journey was over we had bagged several new and interesting unknown plants. Returning late that afternoon I visited my special trees with the thousands of T. tricolor clusters near the Panamonte; and with my "plant remover" atop four extension poles I dislodged several large masses of bright red plants. Attempting to get a few more I immediately found myself covered with small black bees from a nest I must have torn open with my pole. Running about 10 yards, I finally realized they were a non-stinging kind. Obviously irritated they nibbled my exposed arms and neck, but did little more harm than that. I thought that was equitable for having broken into their nest. The days were always sunny in the mornings at Boquette, but by mid afternoon scruffy clouds nestled on the mountaintops and partly obscured the sun as they spilled into the valley below. In a cool mist we cleaned our plants as a friendly rainbow curved above the hotel and seemed to point down the path to my collecting trees — not a pot of gold, but certainly a treasure valued by any bromeliad collector. The next morning our bags and plant boxes were stowed on the bus and we were only again off to David for the short flight back to the heat and Panama City where Carnival — their Mardi Gras — was progressing. Naturally, as we arrived at the Hotel Panama, I noticed the T. flexuosa plants clinging to the streetside trees, and as a few had conveniently fallen to the ground, I rescued them. "Panama-east completed. Panama-west and the jungle ahead," was our thought the next day as we boarded the minibus for our trip. "Mas turismo, mas progresso." blared a sign in broad letters on its flank. Tourists we weren't, and it was difficult to relate to Panama's progress, unless you consider we were contributing to their economy. Though, somewhat like tourists we were taking back Panamanian souvenirs — our plants. The Darien Jungle, which borders Colombia, was more than three hours away by road, so we left as early as we could assemble ourselves after breakfast. Flatland stayed with us for much of the first two hours, but then it gave way to rolling countryside. Signs of civilization vanished and we proceeded on a slow, inclined, clay roadway hugging the mountainsides. We climbed until deep jungle-clad valleys and ravines were on all sides. Spanish moss hung tinsel fashion and pendulous weaver bird nests dangled like ornaments from tall trees and swung in the gentle warm winds of the Darien wilderness near our destination. Truly wild, this was a breathtaking place. Quiet and serene, this was the real pre-Colombian Panama — as unchanged as before European man's advent to the fringes of this untamed isthmus. We had gone as far as our minibus would take us, so we boarded two government jeeps to finish the short leg of our journey. The Panamanian Government was constructing a road through the Darien to Carti and we were this day's guests of the Ministry of Public Works. We had special permission to collect along the new road and where the trees had been felled. 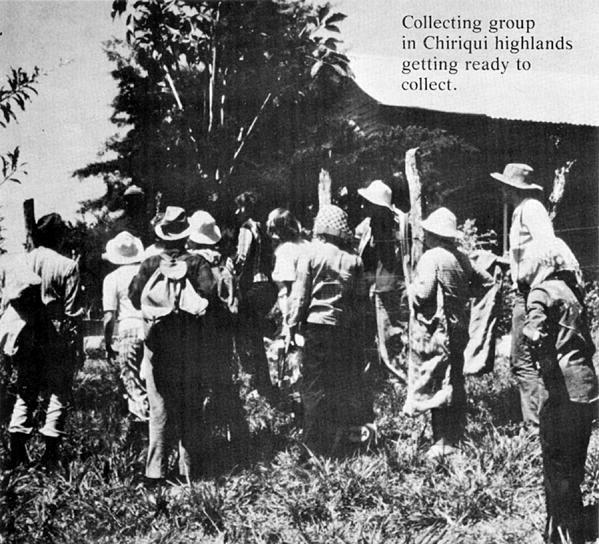 The Government insisted on tagging along mainly to protect us from marauding animals — the jaguar, puma, tigrillo, and ocelot — any of which might be injurious if stumbled upon or frightened. We never saw any of them as we moved about noisily — though when off by myself, I often heard rustling in the bushes that momentarily gave me a start. We often heard monkeys but rarely saw them because they stayed in the dense foliage ahead of us. Daily rains muddied the heavy, reddish clay soils of the roads and even the jeeps got stuck once or twice on the steeper slopes. A quick persistent assist from a bulldozer and we were off again. Finally it was time to do serious collecting and off we went. Two of us spotted some unusual plants in a tree at the side of the road. Before we could climb it, however, one of the bulldozer operators anticipated our plant and hastily pushed it over with his machine. A small snake fell out of the branches as it collided with the earth. Amidst excited movements and cries, several natives reduced the lilliputian creature to a mere spot with their feet — a needless duty to a jungle denizen whose home we had invaded. The tree, now accessible, had mostly tillandsias, and the unusual plant we saw before the tree's downfall was T. guanacastensis. Small and richly spotted were these beautiful plants with deep green tightly clustered leaves. Their short-branched flower spikes were just emerging from within. I managed to retrieve eight plants, and fortunately too, because this was the only tree on which I found this species. Parting the foliage I also discovered T. crispa and T. anceps — clinging to each other as if terrified from their host's recent earthbound decent. Some of the collecting group cleaning plants behind the Panamonte Hotel at Boquette. Preferring to collect alone for the rest of the day I ascended a brush-covered hill to its crest, and from there I could survey the countryside. At the summit was a large Aechmea angustifolia with boldly spread leaves that appeared as if it was defending its spot as king of the hill. Nearby, a recently fallen tree carried several clusters of well-formed Aechmea nudicaulis. I chose to travel parallel to the road below and moving in that direction I found my first wild Guzmania musaica. Here and there were other unidentifiable species of bromeliads and orchids which I cursorily inspected and occasionally collected, while concentrating on this new find. Managing to collect six specimens I later tallied up my day's collecting and among the hundred-odd plants I had captured over 20 species — the total for the trip was 34 species. common plant there was a Guzmania exactly like G. musaica in form and flower, but without banding. "Could this be the variety concolor," I thought. It may have been, but it had not been recorded for that locality previously. If it was I never resolved it. The prize plant of the wettest portion of the valley was 'pheasant leaf' as Henry Butcher called it. It resembled Guzmania vittata, but had softer more numerous leaves. Returning early that day we had just enough time to clean our plants before dinner. We joined for a farewell banquet by the pool under the stars and toasted our guide and the friendly people who made it one of the finest collecting trips yet taken. Long into the night we reminisced about this beautiful land, and secretly began planning for the next collecting trip, hoping it would soon come to pass. From West Australia — Bernard Stonor writes: In the January number of the Journal the article on Aechmea milsteiniana interests me very much. We seem to have two types of A. fosteriana here, one with numerous markings in the leaves as described in the books and the other with only a few dark markings. I have one of the latter type growing outside in my garden, and it flowered last summer. The inflorescence looks remarkably similar to the illustration of milsteiniana. I would think it is definitely bipinnate. 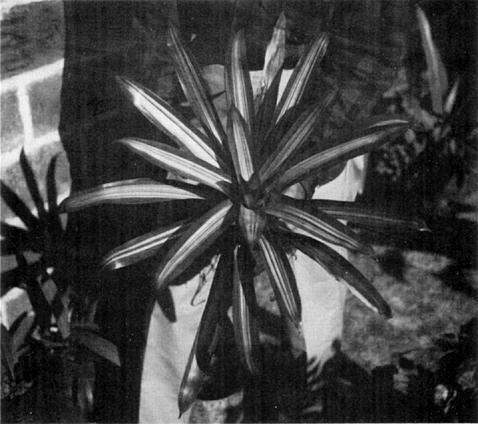 There were six spikes, each with 5 to 7 flowers and the inflorescence though not so long as the one illustrated was pendant when fully developed. The rachis might be called either geniculate or flexuous. Although grown in the open in part shade, some of the leaves have very few markings. The inflorescence is so similar .to the one illustrated in the Journal that I really don't know whether to call if fosteriana or milsteiniana. Other growers in Australia have the plant too. It was originally imported from the U.S.A. about 1965. A NOTE FROM AUSTRALIA — The cryptanthus hybridizing has been too bountiful, but I don't give my cryptanthus seed away. They are my favorites, but I can't see my growing all of the seed. One thing about crossing hybrids, particularly with cryptanthus, is that the seed is not so viable as the species seed. The further I get away from the species, the less germination in the seed. I have some fantastic cryptanthus hybrids. One, I call 'Glory Be,' and I am so proud of it. Madam Ganna Walska is one of the parents. It is medium sized, a rich glowing red with deeper shades of purple. The fossil record of the Bromeliaceae is scanty to say the least and only one valid species is currently known, that of Karatophyllum bromelioides, described by Gomez (1972). 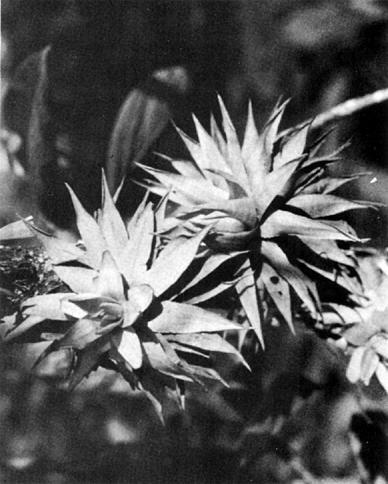 The leaves are the sole evidence, with marginal spines on them suggesting they are members of the Pitcairnioideae or Bromelioideae. These specimens were collected from middle Tertiary sediments of Costa Rica (Figure 1). Previously reported fossil bromeliads from other authors and other localities are all doubtful. Studies of living species have generally suggested that the ancestral bromeliads preferred strong light. 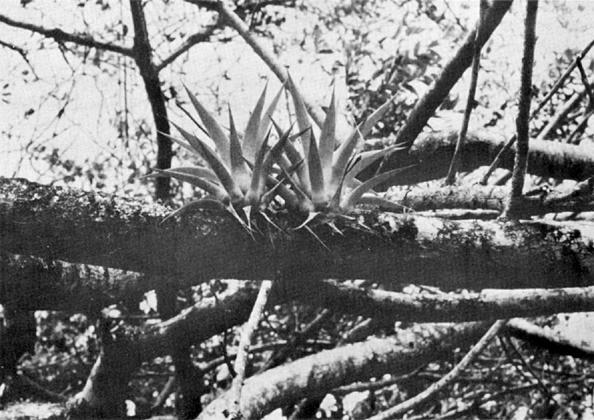 Pittendrigh (1948) thought that this family evolved from desert saxicoles and managed to shift to an epiphytic way of life in upper rainforest canopies. 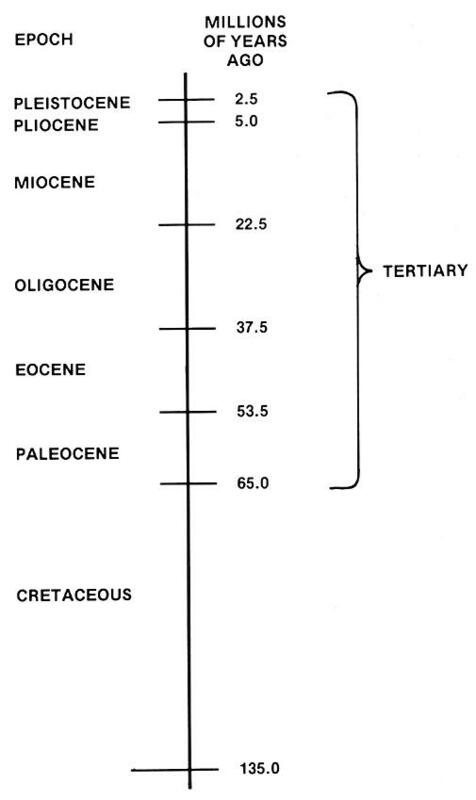 Medina (1974) considered the ancestral forms to be terrestrial mesophytes, adapted to open habitats. The presence of Karatophyllum in the middle Tertiary indicates bromeliads are at least that old but does not give any clue as to what the primitive bromeliads looked like. This genus is probably a midpoint in an unknown lineage and it seems that bromeliads were evolving some time previously. With the exception of an African species (a result of long distance dispersal) and outliers in North America, bromeliads are basically South American plants. It can be assumed therefore that this is where they originated. The continent itself has not always been changeless but has been (and still is) subject to continental drift. About 100 million years ago during the Cretaceous, the earth looked something like Figure 2. In the northern hemisphere a single supercontinent, Laurasia, existed as a result of fusion between North America and Europe. North America, however, was separated from South America. In the southern hemisphere, a single supercontinent called Gondwanaland was just beginning to break apart. It consisted of South America, Africa, Antarctica, Australia, New Zealand, India, New Guinea, and Madagascar. It was about this time that angiosperms (flowering plants) originated and began to evolve. 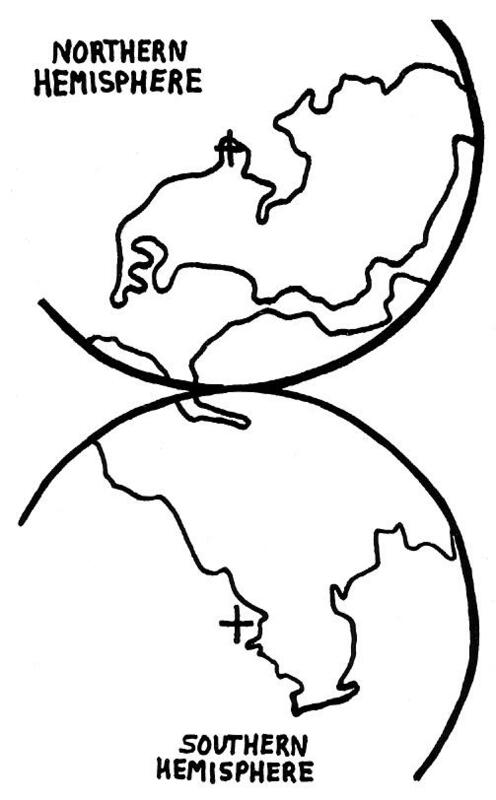 Figure 2: The earth during the Cretaceous. Crosses indicate the poles. 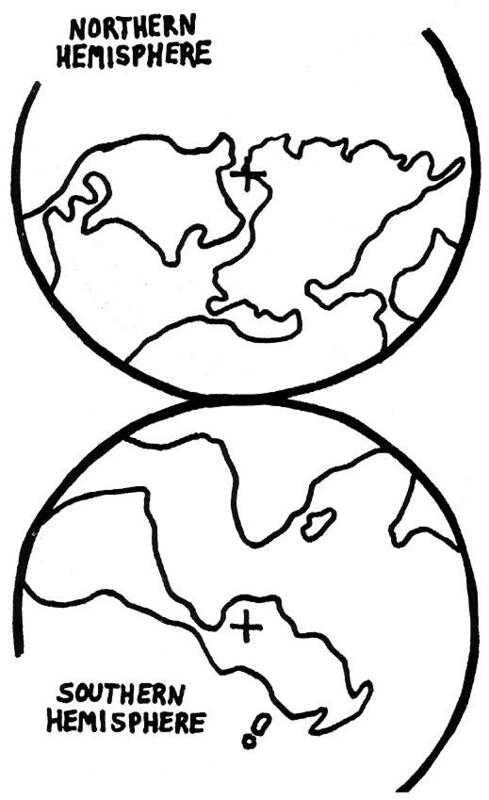 Figure 3 shows the earth as it was 50 million years ago when both Laurasia and Gondwanaland had broken apart. North America has separated from Europe but now has a temporary connection with South America. In the southern hemisphere, India and Madagascar have broken away from Africa. The former is an island drifting northward; it will eventually collide with Asia, creating the Himalayans as a result. South America has also separated from Africa but still has a connection with Antarctica, Australia, and New Guinea, with New Zealand now separated and on its own. It seems probable that bromeliad-like forms originated in western Gondwanaland (Raven & Axelrod 1974) but did not differentiate until well after separation of the continents. Dispersal to North America occurred sometime after the Eocene. The interior of Gondwanaland (eastern South America and western Africa) was arid, suggesting the reason why protobromeliads may have been xerophytes. However, xeromorphic characteristics are not exclusive to plants growing in aridlands. It has been pointed out by Small (1973) that such adaptations are also found in nutrient-deficient areas as well, and plants adapted for one way of life are usually preadapted for the other. Epiphytes, it should be noted, live with nutrient shortages. Various parts of Central America were under water by the early Pliocene. (Emiliani et al 1972), and if any bromeliads were present they would have been wiped out or forced to migrate. The isthmus was reestablished about 3.0-3.5 million years ago, about the same time that the first of the ice ages began (Keigwin 1978). An ice cap appeared in the tropical Andes about 3.27 million years ago and was possibly the first major glaciation (Clapperton 1979). Again some bromeliads would have been forced to adjust or become extinct. The ice ages of the Pleistocene were not as severe in South America as in North America and the Bromeliaceae appears to have come through with great diversity and flying colors. Clapperton, C.M. (1979) Glaciation in Bolivia before 3.27 Myr. Nature 277:375-377. 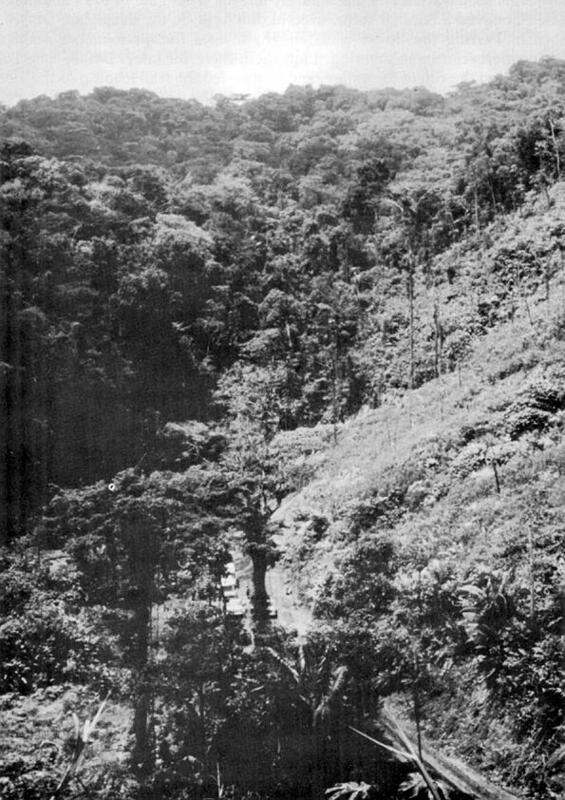 Emiliani, C., S. Gartner, and B. Lidz (1972) Neogene sedimentation of the Blake plateau and the emergence of the central American isthmus. Paleogeog. Paleoclim. Paleoecol. 11:1-10. Gomez-P., L.D. 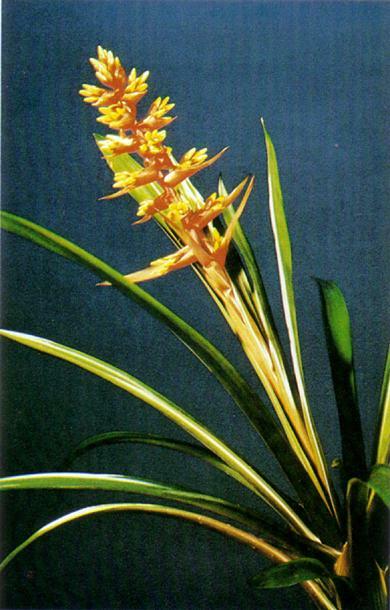 (1972) Karatophyllum bromelioides L.D. Gomez (Bromeliaceae), nov. gen. et. sp., del Terciario Medio de Costa Rica. Rev. Biol. Trop. 20:221-229. Keigwin, L.D. (1978) Pliocene closing of the Isthmus of Panama, based on biostratigraphic evidence from nearby Pacific Ocean and Caribbean Sea cores. Geology 6:630-634. 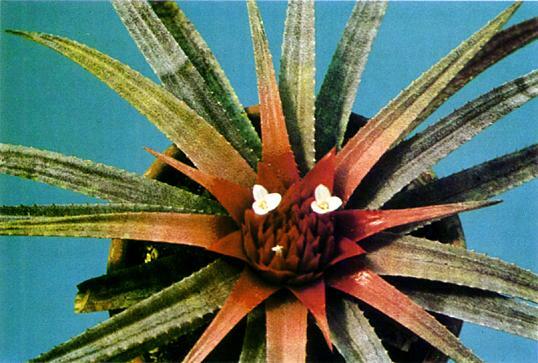 Medina, E. (1974) Dark CO2 fixation, habitat preference, and evolution within the Bromeliaceae. Evolution 28:677-686. Pittendrigh, C.S. 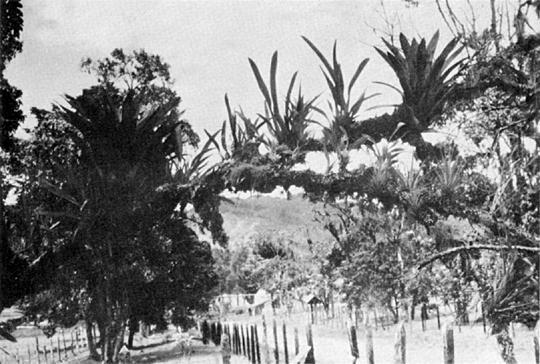 (1948) The bromeliad-Anopheles-malaria complex in Trinidad. 1. The bromeliad flora. Evolution V2;58-89. Raven, P.H. and D.I. Axelrod (1974) Angiosperm biogeography and past continental movements. Ann. Missouri Bot. Gard. 61:539-673. Small, E. (1973) Xeromorphy in plants as a possible basis for migration between arid and nutritionally-deficient environments. Bot. Notiser 126:534-539. Smith, A.G., J.C. Briden and G.E. Drewry (1973) Phanerozoic world maps. In Hughes, N.F. (ed.) Organisms and continents through time. Spec. Papers in Paleon. 12:1-42. One of the many problems that faces beginners is the great variety of suggested methods concerning the different aspects of growing bromeliads. When faced with the choice of potting mixes, fertilizers, insecticides, and containers the novice is bewildered by the infinite number of combinations available from manufacturers. Any product that can be found locally should be desired over more exotic materials that must be imported from another country or another state. This is not to say that those special mixtures of fertilizers or potting media are less desirable, but that the basic philosophy for beginners should be to learn to grow plants well with easily obtained materials and then to experiment later. Don't invest in bulk quantities of materials until you have a need for them and you have found they work under your conditions. For example, if you buy large containers of fertilizers or insecticides, manufacturers sometimes assume that you are going to use them for large applications, so unless you enjoy trying to convert five pounds per one hundred gallons of water to one teaspoon per pint, read the labels before you buy to see if it fits your needs. I would like to be more specific on each of the four different materials the beginning grower needs in order to get started. This is the hardest to give advice on, as materials vary from locale to locale. If you can't find a potting mixture that is coarse enough to allow for fast drainage, you may have to add something such as sharp builder's sand, Perlite, or fine fir bark. Remember that if you can't find suitable premixed soils and have to mix your own, try to stay with no more than two ingredients and keep those to a fifty-fifty proportion. For instance, I use a mixture that contains redwood sawdust, but for a grower on the east coast this might be considered an exotic material. I grow every brom I have (except the scruffy leaved tillandsias which are not potted) with just two different mixes. For the epiphytic and tank type broms, my number one mix is redwood sawdust and Perlite, one part each. For the terrestrial broms I use one part of redwood dust, Perlite, and peat. It has been many years since I abandoned, the 'pinch, dash, shovel, and cupful' method of making potting mixes. Again, stay with materials that are easy to get as long as they meet your basic requirements. Any water soluble fertilizer that is evenly balanced in nitrogen, phosphorus, and potash, such as a 10-10-10 or 5-5-5 ratio, will give success. The only notable exceptions are the fish derivative type fertilizers which when used in vase type broms will usually form mold and mildew and also exude a special aroma that only fish are noted for. This type, however, works well for the terrestrial broms. A word of caution concerning fertilizers (and insecticides) — unless you are familiar with the results of the recommended dosages, start with half strength or less and work up. Overdoses of chemicals on plants have the same effect as overdoses on people — it can be fatal. The three most persistent animals to get rid of are mealy bug, aphid, and the various forms of scales. These are all sucking-type insects that unless checked in time can turn your enjoyment of plants into a headache. All of these bugs can usually be washed or scraped off if caught in time, but if you miss one, it's as good as missing them all. The first line of defense is to thoroughly inspect your plants on a regular schedule, especially any newly acquired plants, and if necessary quarantine them until you are certain the plants are pest free. It if becomes necessary to use an insecticide, there are two points to remember: use an insecticide recommended for the particular pest you wish to eradicate, and find and use an insecticide that has either very low or no petroleum derivatives. The oils found in liquid insecticides are used primarily as penetrants, spreaders, and suffocates, and it is those oils that damage bromeliads. As an example, liquid Malathion usually contains about 30 percent petroleum hydrocarbons. I have found that after using a wide assortment of different liquids and using the same dosage to treat different broms that the performance tends to be too erratic — where one plant would show no signs of damage after spraying, the next would be badly burned. It became obvious that what was needed was an insecticide that was easy to handle, could be used at the recommended dosage to control the particular bug I was fighting, and could be used without hesitation on all of the broms that I grow. 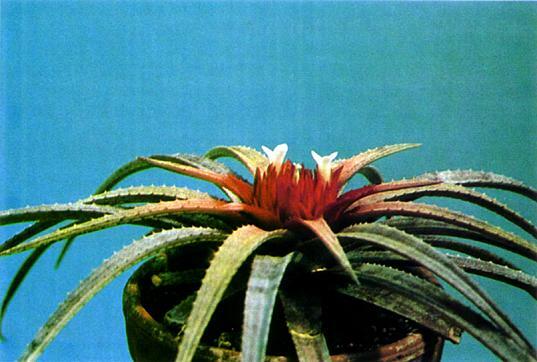 I am presently using Malathion in a 25 percent wettable powder with a nonionic wetting agent and have used this combination on the smallest seedling, the rarest tillandsia and the tenderest guzmania under many variations of weather, humidity, and light without damaging anything except the bugs. This solution is fed through the hose and sprayed directly on the plants and is left until the next regular watering. I might add that I mix my fertilizer in with this solution and get it all done at once. Many of the new premixed houseplant sprays on the market are low in oil content and are suitable as cleanup sprays and especially as a fast control for aphids. These should not present any problems unless you have specific preference as to style or whether it is made of clay or plastic. Anything that is readily available, has provisions for good drainage, and is aesthetically pleasing to you is the container to use. As to the size of the pot for your plant, you will have to balance the proportions to suit your taste. The main point of this article obviously is to help simplify the basic material needs for growing bromeliads. You'll have to supply the love, light, and humidity. I might add that if you're happy and successful with what you use to grow your plants, disregard this article. But if you decide to try something different, enjoy it and keep it simple. Tropical Botanikal Adventures as presented by Mr. Kurt Meyer of Guatemala are not to be overlooked by those who wish to combine adventure, beautiful scenery, exciting plant collecting, interesting accommodations, and many untold delights in a vacation of a week or two. Guatemala is still a land that is unspoiled, and Mr. Meyer takes his parties to places not usually seen by the average tourist. For a detailed account of one such trip see the Journal for May—June, 1976, page 104. See advertisement on page 183 of this issue. Although the third and final part of the Monograph of the Bromeliaceae (Bromelioideae) is at the printers at this writing, new species are expected to appear from time to time as field work continues in the tropics. Certain wild collected species which are seen in bloom for the first time in cultivation, may also prove to be new to science as in the present case of the previously undescribed Orthophytum burle-marxii. Rivaling O. navioides L. B. Smith (illustrated in Journ. Brom. Soc. 23 (6): 244.) the present species was originally collected and cultivated by Sr. Roberto Burle-Marx, but our material was sent from Munich, Germany, where it was successfully flowered by Herr Bogner. 2a. O. BURLE-MARXII L. B. Smith & R. W. Read, sp. nov. Ab O. navioide (L. B. Smith) L. B. Smith, cui valde affinis, foliorum laminis subtus densissime albo-lepidotis, bracteis florigeris integerrimis differt. LEAVES numerous, densely rosulate, 2 dm long; blades narrowly triangular, to 15 mm wide, subdensely white-lepidote above, completely covered beneath, laxly serrulate. INFLORESCENCE capitate, compound, sunk in the center of the rosette; primary bracts broadly triangular, covering few-flowered flat fascicles, subentire. FLORAL BRACTS narrowly triangular, exceeded by the sepals, entire, laxly lepidote. SEPALS lanceolate, acute, 17 mm long, lepidote, the posterior ones alate-carinate; petals 24 mm long, bearing 2 vase-shaped scales well above the base; ovary strongly-flattened; placentae subapical; ovules obtuse. BRAZIL: Cultivated in Munich, Germany, in 1978 from material received from R. Burle-Marx, presumably collected in Bahia in 1965, J. Bogner 1311 (holotype US). Smithsonian Institution, Washington. D. C.
We have previously discussed the use of the morphactins as an aid in the propagation of monopodial orchids and bromeliads. There are also some other types of auxin antagonists which seem to be useful in the propagation of some orchids and we believe that they should also be tried with the ornamental bromeliads. Considerable attention was paid to molecular configurations in the early days of investigations on auxins. Slight changes in the chemical structure would often render a compound inactive as an auxin or, in some cases, as an antagonist of auxin action. Thus tri-iodobenzoic acid (TIBA) was found to overcome auxin action and was considered to be an anti-auxin. Miller (1977) has distinguished between compounds such as TIBA which has an irreversible action and those such as coumarin and cinnamic acid which have a reversible action. Thimann (1977) also classifies auxin antagonists in several groups according to their mode of action. Thus he (p.233) does not consider skatole or 2,4 dichloranisole to be true anti-auxins, since the inhibition of the auxin is not overcome by adding more auxin. On the other hand, he classifies 2,4 dichlorophenoxy-isobutyric acid as a true auxin antagonist (p.248). Cinnamic acid was isolated from cinnamon early in the 19th century in France. Trans-cinnamic acid has been used with considerable success as an aid in the propagation of monopodial orchids by several investigators on the Irvine campus of the University of California. This substance promotes bud formation by overcoming the action the auxin produced in the plant which tends to inhibit buds. Goh (1977) found that 2,3,5-tri-iodobenzoic acid (TIBA) and maleic hydrazide (MH) applied to the stems of monopodial orchids produced many shoot initials. He found that continuous injection of the active material through a hypodermic needle with the plunger of the syringe removed was preferable to spraying or the use of a wick. Ball and Arditti (1976) used sterile cultures of explants of the flowering stems of Dendrobium orchids. These were cultured on a modified Knop's solution with vitamins, a cytokinin and an anti-auxin (trans-cinnamic acid). The desirable concentrations of the latter varied according to the position of the nodes on the stem. Concentrations were 1.5 mg/l for upper section nodes, 14.8 mg/l for middle sections and 148 mg/l for the basal nodes. Arditti, Ball and Reisinger (1977) also obtained sprouting form explants of the flowering stems of Phalaenopsis, using a medium which contained 14.8 mg/l of trans-cinnamic acid. The flower stems were sterilized in a chlorox solution and the explants were incubated under 150 fc of illumination, using a mixture of fluorescent and incandescent lamps on 16 hr photoperiods. These authors also used the amino acid iso-leucine and suggested that it may possibly act as an anti-auxin. The results of Goh (1977) suggest that these and similar auxin antagonists be applied directly to plant parts of both orchids and bromeliads in order to stimulate offshoot formation. Arditti, Joseph, Ernest A. Ball and Diane M. Reisinger. 1977. Culture of flower-stalk buds: a method for vegetative propagation of Phalaenopsis. Bul. Amer. Orchid Soc. 46: 236-240. Ball, Ernest A. and Joseph Arditti. 1976. Node cultures as a means of clonal propagation for Dendrobium. Proc. 8th World Orchid Conference 1975. pp. 367-371. Goh, E. C. 1977. Regulation of floral initiation and development in an orchid hybrid Aranda Deborah. Ann. Bot. 41: 763-769. Miller, P.D. 1977. Keiki induction using auxin antagonists. Australian Orchid Review 42: 83-84. Reisinger, Diane M., Ernest A. Ball and Joseph Arditti. 1976. Clonal propagation of Phalaenopsis by means of flower-stalk node cultures. Orchid Review 84: 45-52. Members Please Note — The society announces a change in the Seed Fund Chairman. From now on, those interested in obtaining seed should write to: Diana E. Pippin, P. 0. Box 2352, Riverside, California 92516. 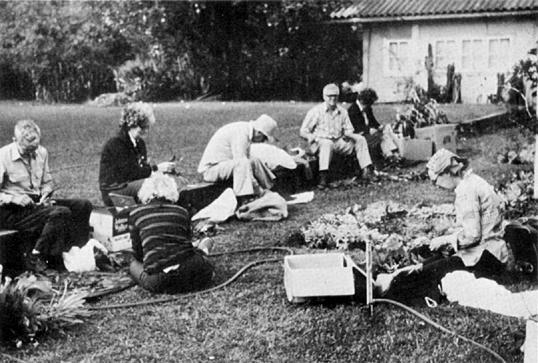 In the May-June, 1977, issue of the Journal, I wrote of my visit to the nursery of Mr. Bak in Assendelft, Holland. Recently Mr. Bak was kind enough to send me several pictures of some of his favorite hybrids. Please keep in mind that Mr. Bak grows seedling bromeliads by the millions (yes, millions) to be eventually sold at the European retail market. Many of these hybrids have taken many years of research and hybridizing before they are deemed worth while to be marketed. Three of his outstanding hybrids are Guzmania × Marlebeca, Guzmania × Mini Exodus, and Guzmania × Remembrance. 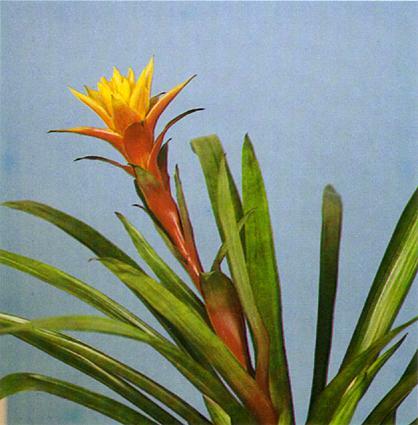 Guzmania × Marlebeca was made by Mr. Bak in 1970 and flowered for the first time in 1973. However, Mr. Bak learned that this cross had been made many years before. Mr. Bak received permission from the original hybridizer to remake the cross and to name it after the city of Marlebeca in Belgium, in which it was grown for the first time many years ago. Guzmania × Mini Exodus was made in 1969 and bloomed in 1971. The cross was also made by Mr. Meyer in the Netherlands and bloomed in the same year. It was so named by Mr. Meyer. However, he unfortunately discontinued making this cross. Guzmania × Remembrance was so named by Mr. Bak because it reminded him of many other guzmania crosses he had made, and yet it is different from any of the others. He grows this plant from meristem, because he found it is too difficult to obtain enough seeds of it. This term has been applied by a California grower to the hybrid aechmea, miniata × weilbachii: here in Florida it has proved to be quite vulnerable. There is, I think, a reasonable explanation of the riddle. Frost and dew are formed by the same process: a surface exposed without wind to the clear night sky loses heat by radiation thereto, reaching a temperature considerably below that of the surrounding air. If at this lowered temperature the water-vapor content of the air is high enough, the air becomes saturated and drops of liquid water (above the freezing point) or ice crystals (below) deposit on the surface. The temperatures at which these condensations occur, however, are not fixed but depend on the humidity of the air; if it is nearly saturated, only slight cooling is required, but it is obvious that in completely dry air there could be no condensation however cold the surface got. Florida's winters are mainly dry, and I understand California's are wet; thus frost on plants here represents, usually, a lower temperature than in California where, in moist air, frost may form only below 32°F. It's the chilling, not the frost, that does the damage; the frost is merely evidence of the low temperature. A contrary view, that frost is injurious, is sometimes expressed. This is something like the old belief that thunder causes milk to sour; of course the real factor is the warm weather, in which thunderstorms mostly occur. In each case two effects are mistaken for cause and effect. 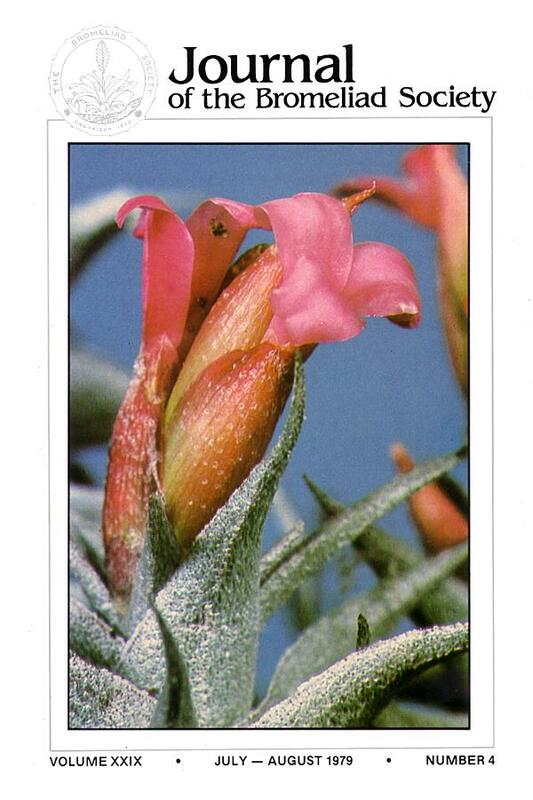 PICTURE ON THE COVER — Tillandsia macbrideana was first described by L. B. Smith in 1930. It is a native to Peru where it has been found growing on rocky cliffs at altitudes ranging from 6300 to 8500 feet. The entire plant is approximately 12 inches long with a much branched stem. The very short scape bears a terminal inflorescence consisting of 5 to 10 flowers. PLANT stemless, flowered about 40 cm high, bearing at base numerous seedling-like plantlets; LEAVES many, rosulate, divergent to recurved, inconspicuous adpressed lepidote; SHEATHS distinct, long-ovate, about 6 cm long, 4 cm wide, with dry membranaceous margins, the outer surface dark violet, the inner side brownish-purpurascent; BLADES narrowly triangular to linear, long acuminate, canaliculate, above the sheaths 15 - 18 mm wide, 20 - 35 cm long, above dark green, below dark violet; SCAPE erect to ascendent, glabrous, about 20 cm long, 5 mm in diameter; SCAPEBRACTS erect, enfolding the scape, about equal to the 30 mm long internodes, the lower ones with suberect foliaceous blades, the upper ones only caudate; INFLORESCENCE simple, distichous, compressed, 10 - 12 cm long, 8 - 12 flowered, before anthesis dense and imbricate, after anthesis lax and the rhachis visible; RACHIS geniculate, yellowish-green and reddish tinged, glabrous, stout, in cross-section semiorbicular; FLOWERBRACTS broad-lanceolate, even, glabrous, at apex sharply carinate and compressed, the lower half ecarinate but with very stout middle nerve, stiff-coriaceous, with hyaline margins, at apex green, at basis bright yellow, 35 mm long, 22 mm wide; FLOWERS sessile, 55 mm long, yellow; SEPALS 38 - 40 mm long, 14 mm wide, longer than the flowerbracts, equal, free, ecarinate but with thickened middle nerve, glabrous, faintly nerved, apex rounded and inconspicuous apiculate, pale yellow; PETALS 55 mm long, 8 mm wide, their blades only slightly flared (10 mm), rounded, recurved, bright yellow, at the inner base bearing two long-ovate ligula, 12 mm long, to 2/3 connate with the petals and 2 mm wide, the free part 3.5 mm wide; STAMENS about 55 mm long, yellowish-white, subequal to exerted; ANTHERS linear, 7 - 8 mm long, dorsifixed, dorsal green, connective dark brown, pollen grains bright yellow; STYLUS 60 mm long, yellowish-white, stigmata spreading and at apex fimbriated; OVARY long-coniforme, 7 - 8 mm high, pale yellowish-green. Habitat: Brazil, Estado do Rio de Janeiro, Serra dos Orgao, alt. 100 - 200 msm. leg. : Amanda and Michael Bleher No. 3 - July 1975. HOLOTYPUS: HAL No. 43408, ISOTYPUS: HB No. 67000. The form with dark violet on both sides of the leaves is designated as Vriesea bleheri f. atroviolaceifolia. Vriesea bleheri resembles none of the known Brazilian species. 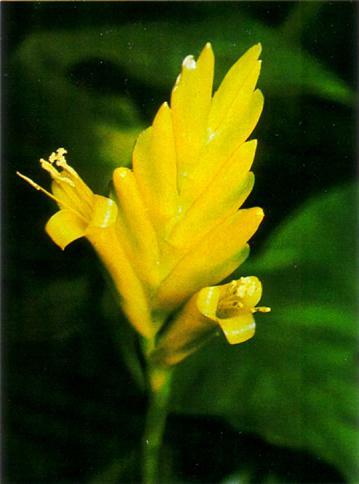 In coloration and shape of the inflorescence it is similar to the Bolivian Vr. maxoniana (L. B. Smith) L. B. Smith, but differs from it in leaf shape and especially in the larger, ecarinate sepals, which extend beyond the flower bracts. (See the color plate in Rauh, Bromelian vol. I (1970)). Vriesea bleheri is not difficult in cultivation. In the winter I keep it moderate to cool with a minimal temperature of 10° C; in the Botanical Garden at Halle they are grown in the warm greenhouse. The only difference is in the faster growth under the warmer conditions. The regular bloom cycle is remarkable. The bloom time has always been in December regardless of whether the plant has been grown warm or cool. It is also noted that immature specimens have also produced some inferior inflorescences. It is difficult, however, to classify Vr. bleheri clearly in the sections VRIESEA or XIPHION, which will differ according to the relative length of the stamens and the petals. In my specimens grown in the cool greenhouse (the drawings in BRADEA) the stamens were approximately equal in length to the petals; accordingly they should be classified in the section XIPHION. In the specimens grown in Halle under warmer conditions (see color picture) the stamens were distinctly longer than the petals; therefore they belong to the section VRIESEA. A further influence of temperature in the formation of the inflorescence is evident in the fact that in the cool-grown specimens the rachis elongates more quickly causing the inflorescence to be more open at the beginning of antithesis. The inflorescence of the warm-grown specimens, on the other hand, remains dense for a longer time and becomes open only after blooming. Because of the dark violet leaves, the nicely shaped rosette, the brilliant yellow inflorescence and, last but not least, because of the favorite December blooming time, this new Vriesea bleheri will certainly attract the attention of commercial growers, whether as a species plant or as a hybridizing partner. Bromeliad growers in Florida are combining efforts to present the best possible World Bromeliad Conference in Orlando beginning May 1, 1980. These cooperative efforts have resulted in an astonishing unification of the Sunshine State's bromeliad societies. While it was generally accepted that they existed, the societies were unknown to one another until after 1977. Bromeliad Society of Central Florida, host society of the 1980 World Conference, was convinced that all bromeliad lovers in Florida would be needed in order to present the sort of show which would honor our State and the proliferation of beautiful bromeliads which we grow so well. As a result, the Florida Council of Bromeliad Societies was formed. This council consists of two representatives from each of the state's eight societies (soon to be nine), and regular meetings are held quarterly on a rotating basis around the state. 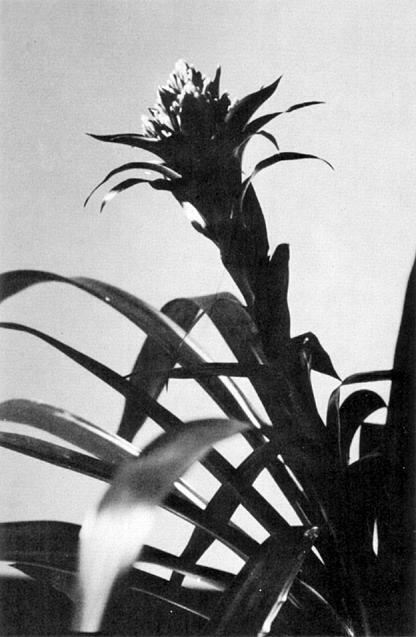 In the 18 months of its existence, the Florida Council has begun publication of "Grande" magazine, presented two annual Florida International Bromeliad Shows, organized a bromeliad judging school which will produce in excess of fifty qualified judges prior to May 1, 1980, and best of all, the affiliates have become known to one another. The 1980 World Bromeliad Conference will be held in Orlando, Florida, on May 1 through 4, 1980, at the Sheraton Twin Towers, the largest hotel convention facility in the area. Registration forms will be included in your November-December 1979 and January-February 1980 issues of the Journal. Registration blanks will also be mailed to all affiliate societies throughout the world. Commercial growers interested in participating should address inquiries to Ervin J. Wurthmann, Commercial Sales Chairman; 2010 Front St., Valrico, Florida 33594. May is high season for bromeliads in Florida. We look forward to sharing our beauty with the world and hope that we will have plant entries from all over the world also. OCHAGAVIA CARNEA (Beer) Smith and Looser This photograph was taken by one of the members of a plant he saw at the Royal Botanic Gardens at Kew, England, and labeled "Rhodostackys andina". 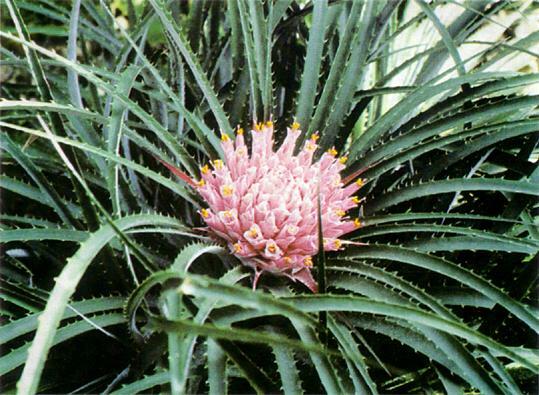 It is in reality Ochagavia carnea, a bromeliad which has gone through several name changes, having at one time been classified as a bromelia and a hechtia. A native of the Chilean coast, it is to be found growing on rocks and on the ground in sunny locations at elevations of 150 to 2800 feet. It is a highly attractive medium-sized plant with very shiny, barbed, recurved leaves about 18 inches long. The inflorescence, the size of a tennis ball, is covered with rosy bracts and is borne on a short peduncle. The flowers have pink to lavender petals and bright yellow stamens that protrude beyond the petals, giving the inflorescence a dazzling effect. It is a fine container plant as well as one that is adapted to the rock garden among other succulents. It would seem, from the number of queries in articles and letters, that there is still a great deal of misunderstanding regarding the names of our plants. The International Codes of Nomenclature, now in use for all types of plants, have provided us with a definite set of rules for the naming of both species and hybrids, but, of course, many plants were named before these codes came into force. The principal object of the rules is simple: to insure that every plant has a definite name and that no two plants have the same name. No one is likely to quarrel with this objective, but it naturally takes time to sort out all the plants. The professional botanists are the people responsible for dealing with the species and their varieties, and I think that most of us will agree that they have done a splendid job involving an enormous amount of work. It is only natural that there should be an occasional mistake, but these are sure to be put right in time. I fear that the situation concerning the hybrids still leaves much to be desired. It is largely the commercial growers who produce the hybrids, and it seems to me that they have in many cases failed to follow the rules. In other plant families, such as the orchids, the position is far better. Each orchid is identified by a name which indicates the identity of the parents and whether it is a division from a named clone or just a seedling from the cross, a member of the particular grex. If other nurseries can label their plants in accordance with the rules, I feel that the bromeliad nurseries might well try to do the same. With each plant being offered for sale under a definite name, the customers would know just what they were buying. It is in the neoregelia hybrids that the confusion is the worst. It has proved all too easy to raise numerous highly ornamental hybrids, and little attempt seems to have been made to name these in an orderly manner. To take an imaginary example, we might see a neoregelia advertised as N. × Sunset with a highly colored illustration. This would give no indication as to the parentage or whether the plants being sold were from the clone being illustrated. Now, if the plant was from a cross, either registered or not, named N. × Fortune, the plants offered for sale could be named Neoregelia × Fortune 'Sunset,' Neo. × Fortune 'Rainbow,' and so on, indicating that they were from definite clones and everyone would know just what he was buying. Seedlings from a cross, whether named or unnamed, would still be sold but could not be guaranteed to produce a specific hybrid. It would be up to the buyer to decide whether he wanted to take a chance on the plants being satisfactory. Another difficulty which the hybridists have to contend with is the problem of identifying the parents of a cross. It seems to me that particularly if a cross is to be registered, the hybridist must be absolutely certain that the parents are correctly named. It is easy to see the confusion that could occur if incorrectly named plants were used as parents of a registered cross. Unfortunately, I believe there are a few cases of wrongly named plants being used as parents. Surely, it would be better to leave a doubtful plant nameless when making a hybrid. The species and their varieties present a different problem, at least for those of us who grow the plants for pleasure. I would not care to say how many plants in my comparatively small collection are unidentified. It is most interesting watching these plants develop and seeing what kind of flowers they produce. It would also be nice to know what they are. Many can be identified in time; others never will be. Two problems crop up regularly with these plants: are they species or hybrids? And where do they come from? It is sometimes asked how we can tell whether a plant is a variety or a species sufficiently distinct to be given a varietal name. Here it would seem that we are rather at the mercy of the taxonomists. One expert will name two similar plants as varieties of the same species, and then just as we are used to this arrangement along comes another fellow who says no — they are two distinct species and one receives a brand new name. This problem may not, as yet, be common in the bromeliad family, but it is by no means rare in some other plant families. I would think that to qualify for a varietal name of a species the plant in question would have to differ in at least one major point from the straight species and that the plant should show these differences under all conditions and breed true from seed. For instance a Hechtia glomerata growing here is now, at midsummer, plain green. At the end of the winter the plant was almost entirely red. It would be quite absurd to call these two phases separate varieties. These are just my own views on what would constitute a variety of a species, so don't take them as official. One case of variety or species which sometimes causes the more serious minded growers to tear out their hair, at least here in Australia, concerns the Aechmea miniata — Aechmea fulgens group. Are the plants all one species with several varieties or are they, as botanists maintain, two species each with its variety discolor. I have grown many plants during the last twelve years or so, labeled either A. miniata discolor or A. fulgens discolor and I can see little difference between any of them. Some are probably the hybrid 'Polyantha'; some perhaps are 'Magineli.' I don't believe any of these are the true species. According to some descriptions A. fulgens has an inflorescence which is compound near the base only and is sometimes described as having red petals. None of the plants which I have acquired as A. fulgens has these details in the inflorescence. Certainly many of the plants labeled fulgens var. discolor are in fact either miniata var. discolor or one of its hybrids. Whatever the exact relationship of the various species may be, the taxonomists have tried to insure that each plant has a separate name by which it can be identified, and there will always be some disagreement as to how closely certain plants are related to each other. The problem confronting the average grower is to find the correct name for each plant, and there is unfortunately rather a lack of detailed information on the subject. Not everyone can obtain the many publications in which the descriptions may be found, and there is still much confusion over the identity of such well-known species as Billbergia venezuelana, let alone the many less common species. The many excellent color illustrations and descriptions of interesting plants published in the Journal are of particular value to those of us who live in the 'outer suburbs' of the bromeliad world. Although we may not always agree with the taxonomists in their arrangement of the species and their varieties, at least they have given the plants a name by which they can be recognized. The next step is the naming of individual cultivars or selected clones of a species, and I confess that I am not still sure whether there are any definite rules covering this aspect of species names. Some system is obviously desirable to avoid the problem of similar clones receiving several different names. John Walton, 16 The Esplanade, Naraabeen, N.S.W., Australia 2101, would like to contact any nurseries interested in obtaining large quantities of bromeliad seed. He could supply a total of 50 to 100,000 seeds of Aechmea zebrina if there is a market for them. His list includes many choice items. This specimen was discovered by the botanists Dimitri Sucre and Pedro No Braga in 1968. This charming tillandsia is usually found growing in large formations in almost inaccessible places such as bare granite cliffs and exposed to the sun and more or less constant winds. It was discovered in the municipality of Petropolis, state of Rio de Janeiro, at an elevation of 750 meters. This plant was named after the eminent Brazilian botanist, Dr. Graziela M. Barroso. It is a beautiful specimen of small size (approximately 12 cms in diameter) which is silver in color and starlike in form. The inflorescence is 10 cm in length and bears violet-rose flowers on a pale rose bract. Like all plants of a xerophytic habit growing on rocks, it must be cultivated so that it gets good drainage. We have grown it with great success on cork slabs. T. grazielae (Ruby Graga et D. Sucre) was called T. planorbis by R. Reitz. TILLANDSIA VIRIDIFLORA (Beer) Baker, var. Variegata, W. Seaborn, var. Nov.
A var. viridiflora foliis variegatis differt. Type: Cultivated W. Seaborn s n (US). In cultivation this plant picks up a dark red diffusion. 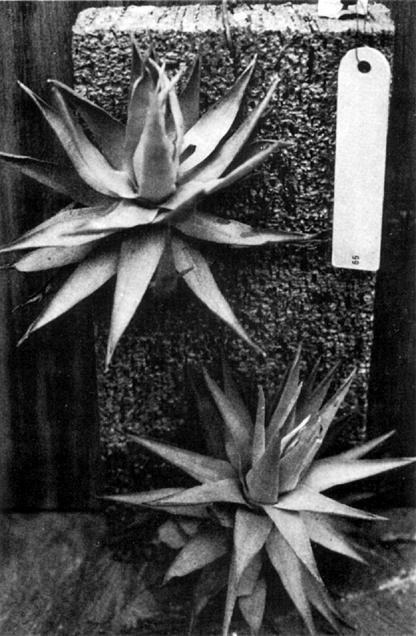 The plant was found in the Jalapa, Vera Cruz, Mexico area, 1968. "A thing of beauty if a joy forever" may well be said of this exquisite bromeliad. It is Aechmea chantinii variegata, as grown by Herman Prinsler of Broich, West Germany.